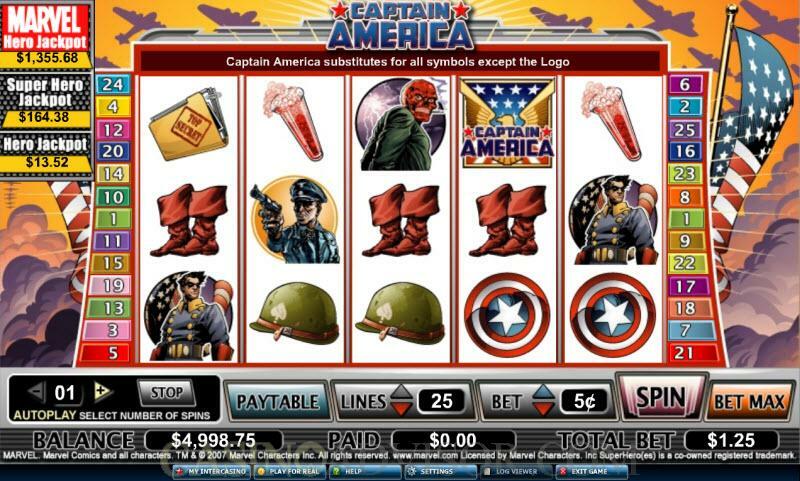 Captain America is one of the branded Marvel slots from Cryptologic. These slots are based on superheroes from Marvel Comics. The symbols on reels are closely associated with the life of Captain America. Steve Rogers was the spindly person who was given a serum (a symbol on the reels) to transform him into the superhero Captain America so that he could defend the nation from its enemies. Therefore many of the symbols are American icons such as the policeman, Statue of Liberty, the American Flag and the army helmet. Captain America’s shield and boots are symbols on the reels as well. Also represented on the reels are Captain America’s enemies including the devilish Red Skull. Captain America is the wild symbol and the Captain America logo is the scatter symbol. Captain America is a 25 payline video slot. The player can select the desired number of paylines by operating the UP and DOWN arrows next to the payline indicator. All paylines can be quickly selected by clicking on the Bet Max button. Next the player needs to select the coin denomination. The choices available to him are 0.01, 0.02, 0.03, 0.04, 0.05, 0.10, 0.15, 0.20, 0.25, 0.50, 0.75, 1.00, 2.00, 3.00, 4.00 and 5.00. The player can select the coin denomination by operating the UP and DOWN arrows next to the denomination indicator. Only one coin per payline can be wagered in Captain America. Clicking on the Spin button activates the reels. The Captain America slot has some fantastic fixed jackpots. Captain America offers the highest fixed jackpot of 12500 coins. Red Skull offers the second highest jackpot of 5000 coins. The Captain America logo offers scatter payouts and triggers the bonus round. This takes players to a second screen. Enemy planes are flying overhead and Captain America is ready to bring them down with his shield. 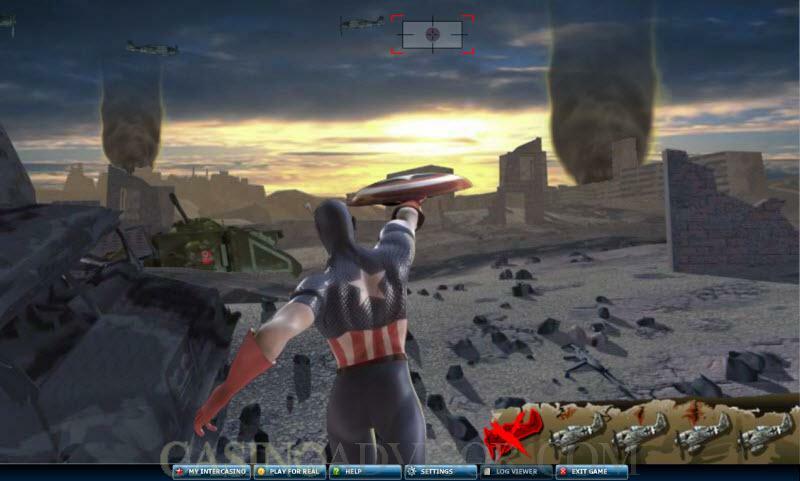 The players select five planes and win bonus credits when they are destroyed by Captain America. If one of the planes happens to have Red Skull then the player wins 15 free spins at doubled payouts. The bonus game cannot be retriggered in the free spins. Captain America has a three level progressive jackpot. This jackpot is shared by all the Marvel Comics slot games from Cryptologic. This ensures that the jackpots grow very quickly. The largest jackpot is the Marvel Hero jackpot, the second largest is the Super Hero jackpot and the smallest jackpot is the Hero jackpot. The jackpots can be hit independently. Hitting the jackpot does not require aligning five like symbols in an enabled pay line. It is a random event. But players are more likely to hit the jackpots if they place larger wagers. Interested in reading more detailed information about Captain America? If so Click Here for more details.